Effective FOD control programs can greatly reduce the high cost of foreign object damage and the potential for injury and even death. General guidelines for prevention include: Training : The foundation of a good prevention program is initial and recurring training for all aerospace personnel in the identification and elimination of FOD, including possible consequences of ignoring it. Inspection : The U.S. Federal Aviation Administration requires a daily inspection of airplane maneuvering areas and removal of FOD. Inspection should continue at regular intervals throughout the day. Maintenance : This must address two primary areas: avoiding debris, and removing debris from airport pavements. And, each organization at the flight operation area should have a prevention program tailored to that particular activity. Coordination : FOD control is most effective when airports and airlines coordinate FOD control efforts among themselves on a local level. 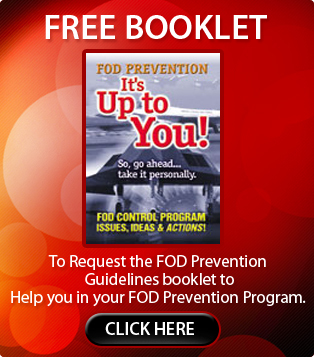 For more information on FOD Prevention programs, visit www.fodcontrol.com or request a free copy of our FOD Control Guidelines booklet "It's Up To You".